I have a confession to make. Well it is only a confession for those of you who don’t know me well. I love Waffle House. Eggs scrambled light with cheese, double hash browns scattered well covered with cheese, white toast, and a diet coke. It is the breakfast, lunch or dinner of champions. Available 24-7 it is a perfect analogy and reminder that God’s love and grace is always available. Actually, the other part I love about the Waffle House is its ambiance. 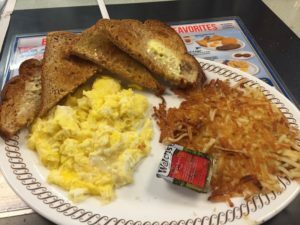 I know ambiance and Waffle House rarely go together in the same sentence, but I love sitting at the counter. Whether or not I was dining with someone or alone I know I can sit at the counter and not only watch but converse with the chef. The ambiance also allows for conversation with everyone in the place. You can talk with a mechanic or roofer. A lawyer or teacher. An accountant or hairdresser. Newlyweds or retirees. Families. Teens and college students. Black, White, Hispanic, male, female, gay, straight and so much more…everyone loves waffles. The conversations were rich and typically civil. The topics were as diverse as the people in it. And anytime it got heated a waitress put folks back in line in a hurry. Alas if you planned it right you could pick the correct background music via the jukebox and suddenly it felt like an episode of Friday Night Light’s or Parenthood. And then last night I realized it may have all changed. you just got to live life to the fullest. I conversed with the cook while he was cooking. I added salt, pepper and the perfect amount of ketchup. I took that first bite and was ready to give a compliment when I saw the chef looking down on his cellular device. I looked over at the waitress who was waiting on a waffle to be done. She was staring at her cellular device and then I began looking around at the rest of the diner. My daughter was snap chatting – no surprise. Everyone wants to see a picture of her taking a big bite of a waffle with chocolate chips and peanut butter. A booth with a family. All looking down and not in prayer unless it was a prayer app. Another table with folks watching Netflix. A lady on her tablet. Everyone staring down, and no one engaged with anyone. Other than the clicking of keys and the sounds of texts going and coming it sounded like a funeral home. Actually quieter. Looking at this scene I nearly teared up. Is this now our world? Are we no longer able to connect with one another unless through a screen? It is scary when you can no longer connect even over hash browns -scattered, covered and smothered. I don’t know the answer and I have been guilty myself of doing this, but I wonder about question that was popular a few years ago. WWJD – What would Jesus Do or at least What would Jesus Think? Think about it – Jesus was often eating a meal, on his way to a meal, preparing a meal for a lot of folks, or talking about eating. But unless Jesus was the chef (such as The Last Supper and Feeding 5000) the menu isn’t what was mentioned. What was filing at the table where the conversations. And if Jesus wasn’t sympathetic with Martha for her sister not helping in the kitchen I doubt he would be happy about folks staring down at their glowing screen. I don’t know if Jesus would dump over the table like he did in the Temple, but he might. I do believe a parable about smart devices making us dumber about the Kingdom of God might appear if Jesus had been subject to cell phones like we are today. So, I am going to do better myself by putting the phone down when at table. I will still go to the WoHo to work sometimes. But when with others I will try to look into one another’s eyes and hear their words. As such I will know a great deal about their heart and soul. There are many other hours to be connected to the world with my device. Just not while putting food in my mouth at table. I am sure I won’t be perfect at this, but I am going to try because I refuse to let my humanity become smothered and covered by a bunch of microchips surrounded by glass and aluminum.